Late last month, we told you that Snapchat was testing a redesign of its UI. 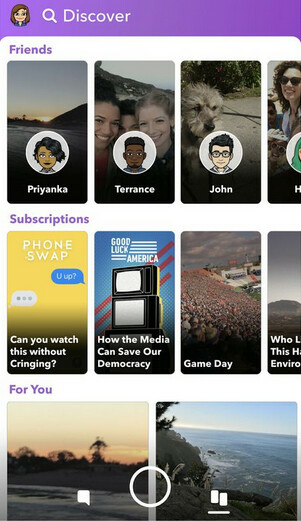 The last time Snapchat made a change like that, it caused 1.2 million people to sign a petition on Change.org demanding the old Snapchat back. The latest changes actually go a long way toward restoring peace and tranquility for subscribers of the messaging app. Once again, Snaps and Chats will be seen in chronological order, and you will find Stories from friends on the right side of the app. Stories and messages will be apart from each other, and a separate subscriptions feed will allow users to find content from their favorite publishers. The redesign's redesign is rolling out to iOS users now. As for those sporting an Android handset, there is no word from Snapchat parent Snap about when that platform will receive a similar update. Back in February, Snapchat co-founder and Snap CEO Evan Spiegel said, "We completely understand the new Snapchat has felt uncomfortable for many." After the company disappointed Wall Street with its first quarter report, the executive blamed the redesign for disrupting user behavior and causing some concern among its advertisers. Snap hopes that its replacement for CFO Drew Vollero calms everyone down. Vollero quit the company last week and is being replaced on May 15th by former Amazon vice president of finance, Tim Stone. Snap recently announced its new AR games called Snappables, and introduced a refreshed version of its Spectacles video recording sunglasses. Nothing new here. Snapcrap was always out for iOS and didn't give a crap about Android. I hope Snapcrap goes belly up. Every time I see you post I can't help but admire what the Japanese did to you people in the 40s. I want to delete the app even more than I did before... the last stories page made more sense because everything was in chronological order and the list was vertical. Now this new update the list is horizontal and it's just worse. I bet after the Android update; It'll still be laggy switching between the stories and camera. It'll still drain your battery life. It'll still take horrible pictures using a basic camera API It'll still drop frames when shooting video. It'll still bombard you with buzzfeed like content.